It’s a strange thing that to writers, writing can be utterly terrifying. One would assume that given this is the person’s chosen profession, he or she would be happy to write! begging to write! willing, able, and eager to write! but sometimes that really isn’t the case. In fact. sometimes it feels like utter madness choosing to do this for a career. In any creative profession, it’s very hard to go “Okay, 1-2-3, create!” but at the same time, there is no right time to create – one has to be diligent and disciplined and actually create a writing habit. There are books, courses, quotes, blog posts, dedicated to creating a writing habit. And yet it is all still easier said than done. I have been trying to make time for my own writing, something I’ve promised myself I will concentrate more on this summer in particular as I have a lighter teaching load near the end of the term and yet the thought of it (doing something I love and that brings me immense satisfaction) completely paralyses me. Isn’t it funny? Writing is what I feel compelled to do with my life (in fact, I started Meerkat in order to be able to do it as part of my career). Writing is what I dream about. Perhaps it’s that I fear really, really putting it all out there and confessing that I’m working on a novel. Then a) I’ll actually have to do it b) people will want to know what it’s about and actually want to read it (gasp!) and c) I’ll actually have to do it! I’m trying to combine some ideas from Gretchen Rubin and Elizabeth Gilbert (check out some of her thoughts on writing)- though I have a suspicion I’m stalling on Idea 1 to avoid Idea 2. Rubin suggests de-cluttering to aid in happiness and productivity, and my office is a total disaster. It doesn’t help that it’s also our music room (this includes an antique organ, guitars, and amps) or that as the term goes on, I end up with piles of extra handouts, papers, etc. from teaching, or that I really need a new desk… At the same time, it’s not as if I have to write in my office or that I have to have a pristine space in which to write (though it certainly helps, I do often do my best work while at a coffee shop/some public sphere – I’m writing this as my students write their midterm). Gilbert suggests setting a timer and writing for 30 minutes; making manageable blocks of time and getting things done. Whenever, wherever. Again, this would mean I actually have to do it! Baby steps, baby steps. At least I’ve taken some time to update my blogs. Next step, more tidying, but also MORE DISCIPLINE, LESS FEAR! 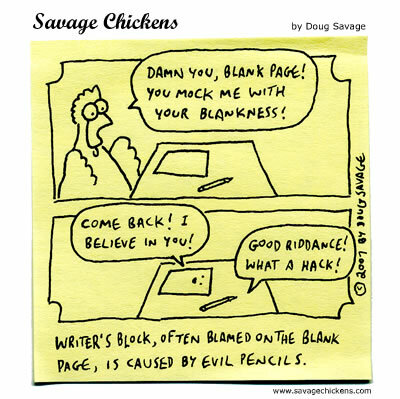 I came across this great Savage Chickens cartoon that made me giggle. I was feeling especially glum because I had finally done some new creative writing and then ended up losing it all on my silly computer, so this majorly cheered me up. Now it’s the blank screen and the keyboard that do us in….